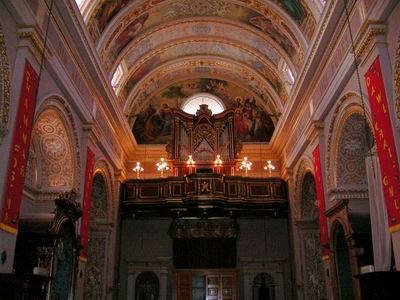 The organ in Balzan Parish Church was built in 1827 by Sicilian organbuilder Felice Platania. It was originally located in a choir gallery behind the main alter �in cornu epistolae�. It was a typical one-manual organ with a slider chest accommodating 13 ranks. In 1898, semi-professional organbuilder Giovanni Felter (who was probably Maltese), dismantled the organ and rebuilt it in the west-end gallery above the main entrance. Of the Platania organ remain most of the pipes, the main slider windchest and its corresponding rollerboard. Felter installed 2 bass windchests, a double-rise parallel bellows with two underlying pumps, a new keyboard and pedalboard, a new stop action, new wind trunks, a new stopped Contrabasso 16� in the pedal, and new mechanical key and stop action in the North Italian tradition. Hence Felter�s work was significant and the organ should be classified as a Platania-Felter organ after this rebuild. The restoration started in 2004 with the complete dismantling of the organ. All parts were inspected to assess their condition and decide the best way to conduct the restoration works. The bellows was in such a bad state that it was reconstructed while maintaining only the ribs. The slider and pedal chests were restored to their optimal condition. The rackboard was rebuilt because the original was too badly damaged to maintain the pipework in a stable condition (the original has now been stored inside the organ). The pipework was sorted out in probable Platania ranks and restored while missing pipework was rebuilt. Console parts like the keyboard, pedalboard and stop action were restored. Almost all the wind conveyances were rebuilt and a new silent electric blower was installed while maintaining and restoring Felter�s manual blowing system. The restored organ parts were transferred back to the church in October 2005 and re-assembled. Great care was devoted to the regulation of Felter�s mechanical action which is now performing very well. Finally all pipework was regulated on the typical low wind pressure of Sicilian organs of the period (44mm in water column in this case). Tuning was carried out according to the Tartini-Vallotti scheme since the original temperament could not be traced due to the raising of the pitch, possibly by Felter. The tonal result has been the greatest success of this restoration and many organists have expressed their appreciation of the beauty and blend of the organ�s tonal characteristics. The organ was inaugurated during an organ recital on Sunday 18th December 2005.